The ariZoni Awards for Theater Excellence have been bestowed since 1990. They honor work in several categories including acting, directing, playwrights, design and others. 2003 ariZoni awards. 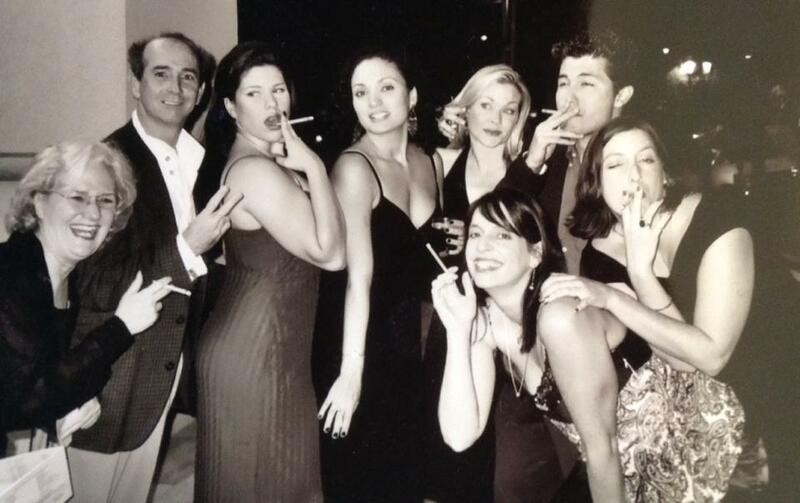 Janet Arnold, Jon Gentry, Andrea Morales De Castellano, Angelica Howland, Jodie Weiss, Katie McFadzen, Gordon Waggoner and an unidentified Tallulah Bankhead look-alike. 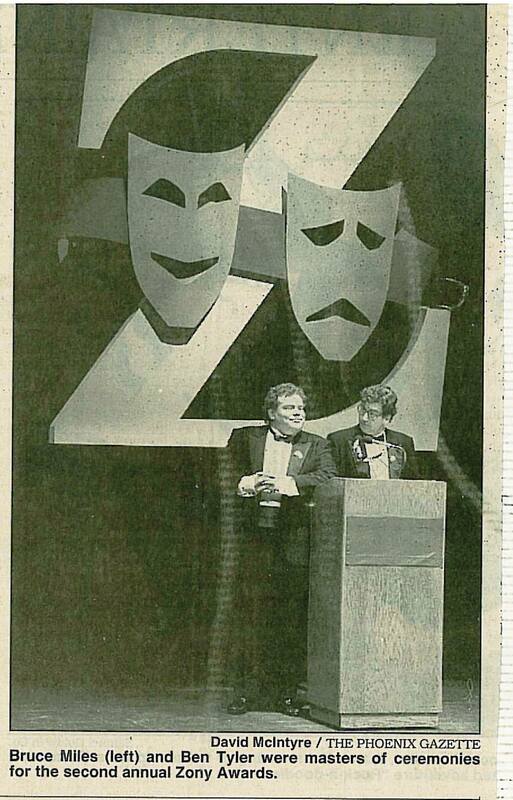 Ben Tyler comments on this clipping: Bruce and me, hosting the 2nd Zony (as they were called back then) Awards at Scottsdale Center for the Arts. That was a great set piece floating behind us. You can’t see it too well in this picture, but there is a large cup resting on the right side of the big Z. The public art had just gone up on what was then the Squaw Peak Freeway. They were kind of odd sculptures of weird objects. One of the items was a large tea cup. We were making fun of it, and as I recall we kind of got in trouble with the Arizona Commission on the Arts, which funded the project. Since 1991, many local theatre people had talked about wanting to do an awards show. But it was Mark Edelman of Theater League who brought the template from a similar awards program to Phoenix from Kansas City. The former Arizona Film, Theatre & Television (AFT&T) was asked to be the objective tabulator and “keeper of the ballots,” and AFT&T members along with Valley theatres organized the first awards program for Stage West at the Herberger Theater Center. Hoping to at least break even for their first attempt, organizers were stunned to learn that by noon, tickets for Stage West had sold out! A few quick phone calls, and arrangements were made to move the obviously popular new event to the larger Center Stage, where the awards have been held all but two of the ten years. Scottsdale Center for the Arts was the venue one year, and the Paul Galvin Theatre on the campus of Arizona State University another. For the first few years, the awards were called the Zony Awards, aptly named by AFT&T member Bob Garthwaite. However, a few years later, in an attempt to register the name, Sony Corporation lawyers told AFT&T the name “Zony” could no longer be used because of confusion it might create with “Sony.” Former AFT&T board member Rosanne Armijo helped create “ariZoni” and the new logo, and it’s been ariZoni ever since. Theatres apply to become part of the adjudication process by selecting one of four theatre divisions: professional touring, contracted, non-contracted (which includes educational), and children’s. Theatres must also meet certain production criteria, including having a scheduled season, presenting on a regular basis, having full-length productions, generally having a minimum of four performance on four separate days, and not remounting previously adjudicated shows unless it is a substantially new production. Contracted theatres must meet two of the following three criteria: operate in association with Actor’s Equity Association contract; have at least 50% of actors and designers as salaried employees; and have a minimum annual budget of $150,000. Non-contracted theatres are community, dinner, educational, children’s, etc. ; the Children’s category consists of primarily children performers. Productions are adjudicated as a play, musical or original work. There are currently 13 categories for adjudication. They include: award of excellence for actress/actor in a major role; actress/actor in a supporting role; directing, musical direction; original script/playwright; choreography; scenic design; costume design; hair and make-up design; lighting design; and sound design. Theatres do the first round of nominations, by indicating which people in a specific production should be considered for each category. Theatres also make two tickets available on a complimentary basis for each adjudicator assigned to the show. Judges are asked to rate each area based on a one to ten scale, with five being “average.” Judges for the first few years were the Valley’s newspaper, radio and television critics. However, it quickly became evident that it was physically impossible for only a dozen people to attend the more than 120 shows that needed to be adjudicated. So, the ariZoni Executive Committee opened the adjudication process to professionals and other area people with a theatre background as judges. Each year, prospective panelists send in a resume and an application that details their backgrounds. Potential conflicts of interest are also requested by each applicant. A committee goes through all the applications and determines who is most qualified to adjudicate. In 2000-2001, there were approximately 115 judges selected to adjudicate nearly 170 shows in the greater Phoenix area. In the beginning, the awards were similar to the Academy Awards, where five people were nominated in each category, and one recipient would take home the ariZoni award at the black-tie ceremony. However, in an attempt to avoid a “popularity” contest, and to truly honor “excellence” in theatre, it was decided that a top percentage of vote getters would receive awards. The tabulation process was redesigned by Jim Pinkerton, then of Actors Theatre of Phoenix, who based it on a standard bell curve. It’s a fairly complicated formula, but one that has worked well for the past few years. And there is a lot of competition at the top! On many occasions there has been a hundredth of a point difference between a finalist and an ariZoni recipient! Beginnning with the 2000-2001 theatre season, five judges, assigned to a panel, see every nominated show. After the adjudicators see a show, the ballots are mailed and maintained in sealed envelopes until the tabulation is done by an independent source. Low scores are eliminated and the rest are averaged according to the bell curve. From the initial theatre nominees, the finalists are determined in each category based on a percentage scale, and are announced to the public. The ariZoni award recipients’ names are kept secret until the night of the gala ceremony, when they are read on stage. Before this time, the only individuals who have seen ballots or the awards are the accountant and the manufacturer of the awards plaques. 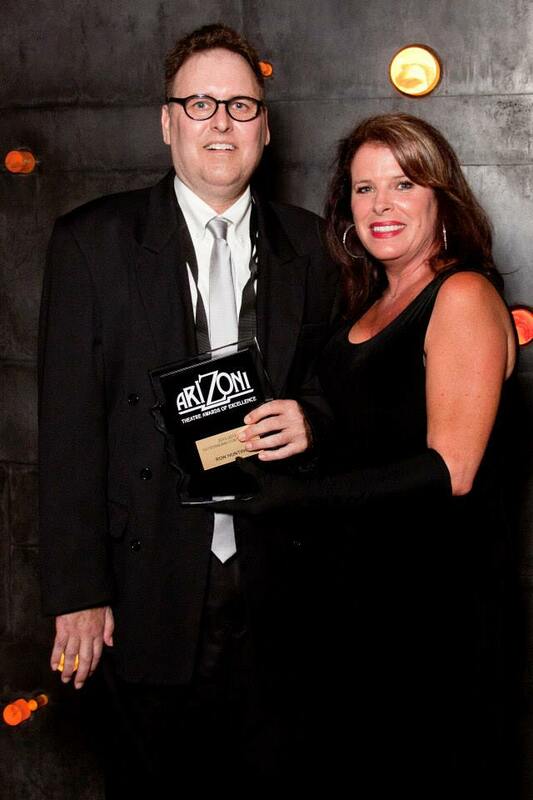 Hosts at the annual ariZoni Theatre Awards of Excellence have been Valley personalities, such as Beth and Bill, and Maggie and Marty, both air personalities from of KESZ-FM, Pat McMahon from KTAR Radio, local actors Bruce Miles, Ben Tyler, Bob Sorenson, Kathy Fitzgerald, Robyn Ferracane and many others. Celebrity award presenters have included Phoenix Mayor Skip Rimsza, television anchor Liz Habib, newspaper columnist David Leibowitz, and a host of other theatre and area dignitaries. In continuing efforts to keep the awards ceremony from running too long, an experiment with an announcer, Phil Allen, and an otherwise “hostless” show in 1998 was well-received, and is still the procedure. The event is typically held on a (usually dark) Monday night in September or October, and a party to celebrate the recipients is held afterward. The ariZoni Executive Committee meets monthly, and is comprised of representatives from theatre companies and professionals in the performing arts. Each year a board president, vice-president, secretary, and treasurer are elected. In addition, one person is elected to the committee as liaison for each of the different classifications of theatre (contracted theatre liaison, non-contracted theatre liaison, and children’s theatre liaison). They serve as the first point of contact for both the theatre companies and the adjudicators. The ariZoni Executive Committee seeks out a local producer and director to coordinate the various aspects of the awards ceremony every year. The producer works closely with the board for guidance and volunteers when needed. The last few months before an awards show is always hectic — awards are created, the set is designed (or pulled together), presenters are confirmed, a small band is found, musical and dramatic pieces from the prior season are selected as entertainment, rehearsals are held, volunteers are lined up, and many, many details are watched. Finally, the night arrives with much excitement and enthusiasm. The Valley’s theatre community gathers… to be reacquainted with friends and colleagues, to celebrate the tremendous accomplishments of those on the stage as well as behind the stage, and to look forward to yet another wonderful year of theatre in the Valley of the Sun.